Take a trip inside BioWare to experience The Final Hours of Mass Effect 3, one of the most anticipated video games of 2012. 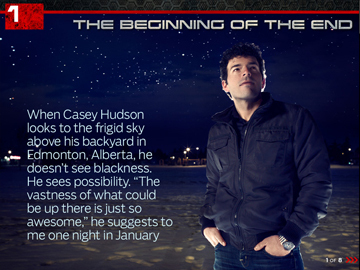 Reporting from Edmonton, Canada, journalist Geoff Keighley (The Final Hours of Portal 2) documents the untold story behind the creation of this epic sci-fi trilogy. Spanning 15,000 words, with extensive video interviews, games, quizzes and other interactive elements, readers will see top secret documents, hear about the rejected ideas and meet the people behind this legendary game franchise. This is one Mass Effect story you've never heard. Download now for iPad or PC/Mac. The real story behind the Mass Effect saga is finally revealed! Geoff Keighley (host of Spike’s GTTV) takes you inside BioWare to meet the team behind Mass Effect including director Casey Hudson. Meet the people behind this legendary game franchise and discover the untold stories about its creation over the past 9 years. 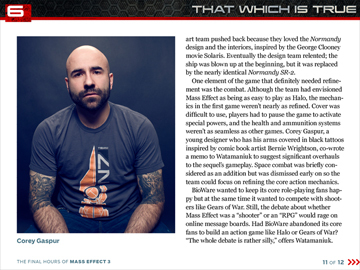 The 15,000 word feature story is accompanied by extensive interactive features, video interviews with Hudson and lead writer Mac Walters, never-before-seen art and details that will get every Mass Effect fan talking. Top secret documents from the early days of production on Mass Effect through ME3. Images and footage from “Mass Effect Team Assault,” a first-person Mass Effect game that was prototyped and never completed. 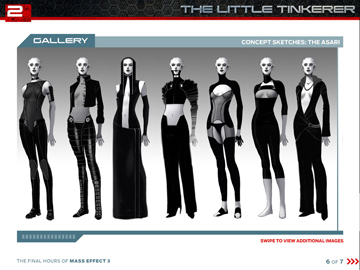 Details on how the plot of Mass Effect 3 changed throughout production, including the removal of a key character. Art and details about the abandoned Illusive Man boss fight from Mass Effect 3. Detailed statistics on player choices. How many players cheated on their in-game love interest in Mass Effect 2? Find out. Deconstructed story scenes from the game where you choose different options to create different outcomes! 360 degree panoramas of the BioWare office and Mass Effect development floor. Reaper Chase, a game where players in the Normandy must avoid the Reapers! A Mass Effect trivia quiz. Interactive polls where users can share their thoughts on the game. Listen to the music that inspired the development team. 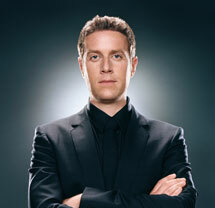 Longtime video game journalist Geoff Keighley is the host and executive producer of Spike TV's "GTTV," the #1 rated video game show on television. He also hosts "The Bonus Round" on GameTrailers.com. The recipient of TJFR "Top 30 Journalists Under 30" award in 2004, Keighley has written for Entertainment Weekly, TIME and Business 2.0. 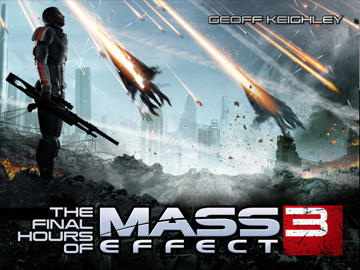 The Final Hours of Mass Effect 3 was designed by Joe Zeff Design. Q: Why do you call these stories "The Final Hours"? A: The name describes the "Final Hours" of development on a game, which I document during the opening pages of each story with a fly-on-the-wall perspective. The name doesn't refer to DLC for the game or the "lost" ending of Mass Effect 3 as some fans have speculated. Q: What makes up a "Final Hours" story? A: To me a "Final Hours" story is an insider's look at the process of developing a game, with a particular focus on highlighting and exposing the people behind the game. If we want our industry to grow we need to do more to highlight the teams and individuals who create some of the best games out there. We often see these individuals quoted and appearing on countless video interviews, but seldom do we find out their backstories and what makes them tick. Q: How do you select a game for the "Final Hours" treatment? A: A lot of things have to come together to make a Final Hours possible. Personally, I have to be interested in a game and I need to have time in my schedule to write the story. On the developer side I need a commitment from the team to give me access and be honest about a game's development. Lately I think about writing a lot of Final Hours stories, but I won't agree to move forward unless I feel like there's a great story to tell and red tape won't get in the way. Q: How often can we expect new "Final Hours" stories? A: There is no set schedule but I have no plans -- or honestly the time -- to write more than a few a year. I will potentially be writing one more Final Hours story in 2012 and I have a few other games I'm exploring for 2013 and 2014. Q: What is the Final Hours of Mass Effect 3? A: The Final Hours of Mass Effect 3 is the story of the creation of the new video game Mass Effect 3 from EA. This multimedia journey takes you through the development of all three games in the series and shares new insights into the creative process behind the games. Q: I don't understand, is this an article? A book? 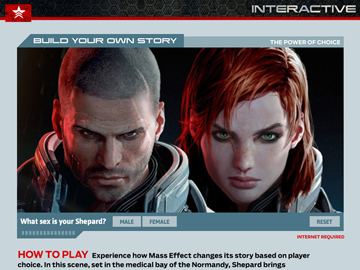 A: The core of this App is a 15,000 word story about the making of Mass Effect 3. The story is filled with dozens of photos, screenshots, audio clips, videos from development, and some interactive experiences as well. A: After the success of The Final Hours of Portal 2 I was interested in creating another app and investing more in its production. 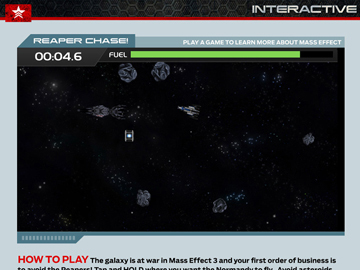 Mass Effect felt like the right game to pursue. My goal has been to create an app that is even more interactive an in-depth than what I did last year with Portal 2. 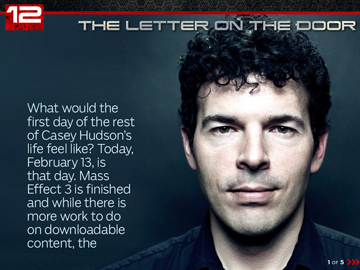 Q: How can I read The Final Hours of Mass Effect 3? A: Currently The Final Hours of Mass Effect 3 is available from the iTunes App Store for iPad devices, PC and Mac and Kindle. The cost of the story is $2.99. Q: I don't have an iPad. Will The Final Hours of Mass Effect 3ever be available to read on the web or other platforms? A: Yes! The Final Hours is now available for PC/Mac and Kindle. I am also working on an audiobook version that is currently being approved by Audible and will soon be available on Amazon and iTunes. A: The bottom line is that this App costs a lot of money to create. Beyond my time there's an army of programmers, designers, photographers and other team members who work on this project. For Mass Effect 3 I've added more video elements and increased the production value from the previous app. I hope you feel that $2.99 is a fair price, especially in a world where art books and other collector's items cost a lot more money. My goal with these stories is just to break even. Q: The Portal story cost $1.99, why does this one cost $2.99? A: The answer to this one is simple: The app cost more money to make. We have more interactivity, original video production, and traveling a team to/from Edmonton (home to BioWare) is expensive. As long as these apps continue to be successful my hope is to increase the production values with each release. Q: How was BioWare involved in the creation of this story? A: A story like The Final Hours is only possible with an incredible amount of support,coooperation and trust from the game development team. Casey and I first started talking about a Final Hours story around Mass Effect in the Spring of 2011 and I began work on it during the summer of last year. Even though he was in the thick of finishing the game, he was generous with his time, as were many other team members at BioWare. They sat down for interviews, photos, and answered countless questions over e-mail. Unlike Valve, EA is a huge game publisher (which owns BioWare) and navigating the kind of access I needed to the team wasn't easy. But I must thank the tireless Andrew Wong, the head of BioWare's PR group, for his energy, responsiveness and support of this project across many trips to Edmonton. Even though he was launching one of this year's biggest games, he and his team, including Lisa Chan, always made time for the Final Hours. Similarly, my thanks extends to Jeff Brown at EA. Many of you many know him as nothing more than EA's oft-quoted and colorful "spokesman," and while his quotes are legendary, he is also one of the smartest guys I know and a dear friend. Jeff was instrumental in inspiring me to continue with the Final Hours series and helped ensure that I had to support of EA to write the story I wanted to write. Q: Have you played Mass Effect 3? A: Yes, I played a pre-release version the game in January (with my name watermarked on the screen in yellow text for 20+ hours). Q: What did you think of the ending? Is this addressed in the story? A: I've seen the uproar online about the ending and understand the fan perspective. Personally I respect the creative choices the team made and had no problems with how the story ended -- it made you feel something, even if that feeling was uncomfortable. The Final Hours addresses the challenges BioWare faces in writing a story with defined parameters in a game environment where players want to feel like they have choice. Ultimately your opinion on the ending will depend on who you see as the "author" of Mass Effect's story -- BioWare or the player. The ending of the game is discussed in the App and there are some notes from the team about how they were thinking about the ending. Since this story was completed before the public release of the game, I do not address the fan petitions or reaction. I hope to update the story with a new chapter on this down the road. Q: I have another question that isn't answered here. What should I do?